Nothing Happens Until it Happens to You is T.M. Shine's debut novel and is a satirical take on what happens when you lose your job in the vicious throes of today's economy. Jeffrey Reiner is comfortably spending his professional years as the calendar editor for a newspaper when he is laid-off during his lunch break. Finding himself in a time-crunch to find another well-paying job before his severance runs out, Jeffrey embarks on a series of odd jobs that cause him to re-evaluate whether working for "the man" is truly how he wants to spend the rest of his professional life. 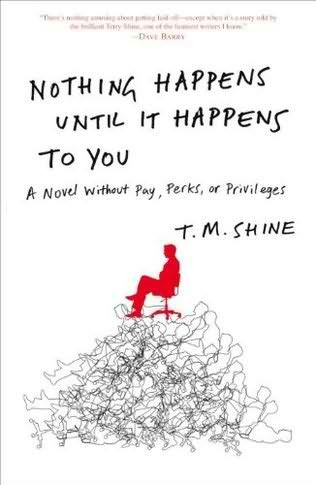 Nothing Happens Until it Happens to You is extremely hilarious and entertaining; I highly recommend it specifically to readers who have been similarly affected by job lay-offs or are currently struggling to find decent work. Shine compares his characters to pop-culture celebrities we're all familiar with (such as Amanda Peet and Jack Black) which especially makes for fun reading -- while his humor consistently hits high on the sarcastic spectrum. Shine sprinkles comments and anecdotes regarding unemployment throughout the novel which are a real treat -- such as the ever-popular, annoying question employed people will ask you upon learning you're out of a job: "What are you going to do?". If I could punch everyone in the face who has ever asked me that question, I'd hold the current MMA Championship Belt. Nothing Happens Until it Happens to You reminds me much of Jess Walter's The Financial Lives of the Poets , which has a similar plot but is much more eccentric and less realistic. Shine's novel is more endearing and hits closer to home for the masses. You'll never look at the dude standing on the corner wearing the Liberty Tax costume the same way ever again.